With an even more powerful engine set-up, with up to 11.3% more peak power than the previous model at 116 HP @ 12,000 rpm, the new ‘R’ delivers a host of additional features including four riding modes, new angle-adjustable, full-color TFT instruments with 5’’ screen, fully adjustable Showa suspension and Brembo M4.32 radial monobloc front brake calipers. FOUR RIDING MODES: Adjust throttle response, ABS, and traction control settings at the touch of a button. 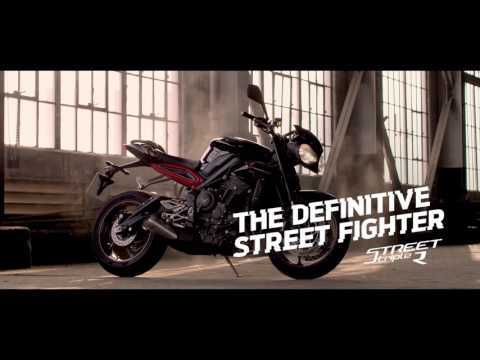 The Street Triple R delivers 4 riding modes; Road, Rain, Sport, and Rider Programmable. ON-BOARD COMPUTER: Key information includes speedometer, rev counter, riding mode, gear position, fuel gauge, odometer, trip meter, journey distance, trip displays, fuel consumption, and range to empty. SWITCHCUBES AND 5-WAY JOYSTICK: To navigate the new instruments on the Street Triple R there are new switchcubes with an intuitive 5-way joystick control that have been ergonomically optimised to be easy to use. NEW SLIP-AND-ASSIST CLUTCH: Helps to reduce clutch lever effort for more rider comfort and control, plus reduces wheel hop and chatter from the rear end under heavy braking. HIGH SPECIFICATION SUSPENSION: The Street Triple R comes with ø41mm upside-down fully adjustable Showa separate function big piston front forks with 115mm travel, and a Showa piggyback reservoir monoshock rear suspension unit. HIGH SPECIFICATION WHEELS AND TYRES: The Street Triple R gets premium Pirelli Diablo Rosso Corsa tires as standard delivering sharp and precise handling, as well as excellent stability and grip on the road. TFT SCREEN: The Street Triple R and RS models feature an angle adjustable, full-color 5” TFT instrument pack that allows users to access the host of state-of-the-art rider-focused technology available from the new on-board computer.There are three different screen display styles to choose from on the R, and six styles on the RS, which alter the layout of the rider information. These are linked to the riding modes, with the style set for ‘Sport’ and ‘Track’ modes focused more on the rev counter and gear position display, and the style set for ‘Road’ and ‘Rain’ modes with a greater focus on the speedometer. To ensure that the screen is readable in all weather and light conditions, each of the three styles can be selected with ‘High’ or ‘Auto’ contrast which uses an integrated ambient light sensor to select the most appropriate setting automatically. Riders can change which the contrast setting easily and intuitively on the move, through the unique ‘info tray’ at the bottom of the screen. 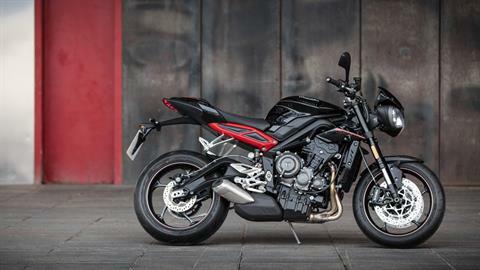 And as if all that wasn’t enough, the Street Triple RS also comes with a lap timer. 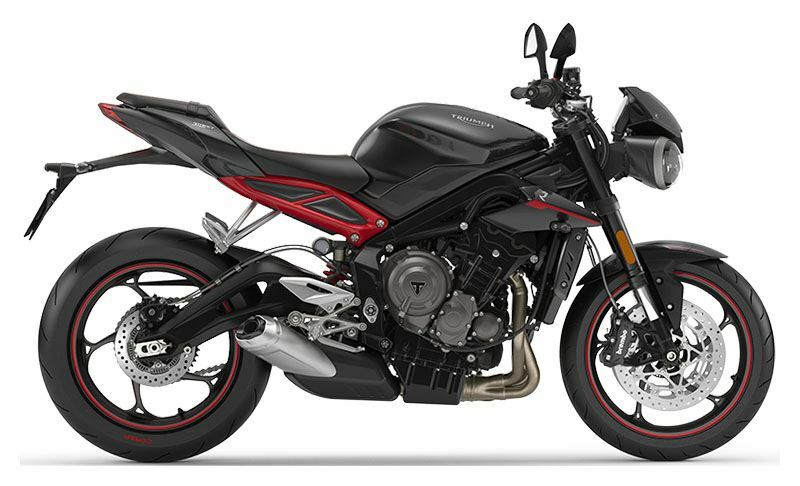 On the Street Triple S there is a fully revised LCD instrument pack, which allows the rider to select the riding modes on the move or at a standstill, and access key information from the on-board computer including odometer, fuel gauge, trip meter, and journey distance. ON-BOARD COMPUTER: ON-BOARD COMPUTER The high-spec on-board computer on the Street Triple S and R gives the rider access to all key information via the TFT screen.On permanent display is the speedometer, rev counter, riding mode symbol, gear position display, fuel gauge, clock and ambient temperature.Additional rider information is also presented in the selectable ‘tray’ at the bottom of the screen, including two trip displays, average and instantaneous fuel consumption, range to empty, riding mode selection, contrast settings, service information, coolant temperature, warning symbol information and exclusively for the RS model, a lap timer. DRL HEADLIGHT: he Street Triple line-up all feature headlights designed for a more aggressive stance.The Street Triple R and RS feature distinctive LED Daytime Running Lights (DRL*) built into the headlights. These bring a new eye-catching light profile that makes the bike easier to see out on the road and offers lower energy consumption for greater long term durability. The DRLs are an amazing 28x brighter than the previous generation bulb sidelight.The Street Triple S features new LED position light headlights. The LED position light is 4.6x brighter than the previous generation bulb sidelight. *Please note that the DRL function is not available in all markets – please check with your local dealer. 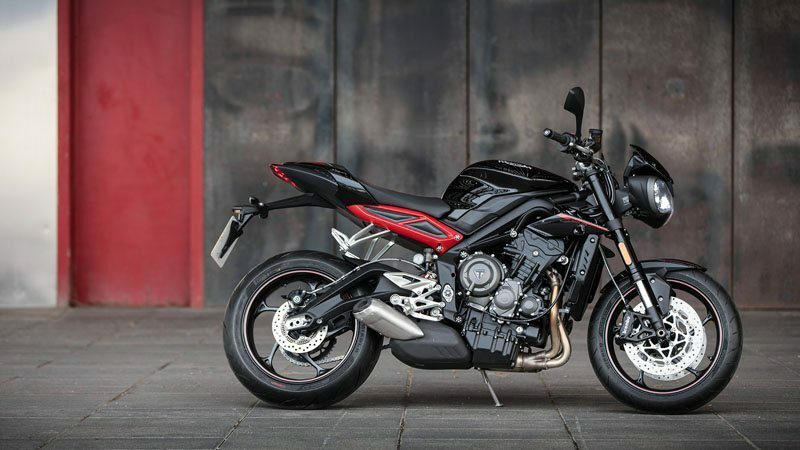 STREET TRIPLE R – EVEN MORE POWER AND TORQUE: The Street Triple R’s dedicated engine set-up, with its own model-specific camshaft, delivers even more power and torque across the whole rev range and low-down. The special R tune increases peak power, delivering 116 HP @ 12,000rpm and peak torque of 57 Ft-Lb @ 9,400rpm. Rear - Showa piggyback reservoir monoshock, 134 mm rear wheel travel. Adjustable spring preload (lock-rings), compression damping and rebound damping.